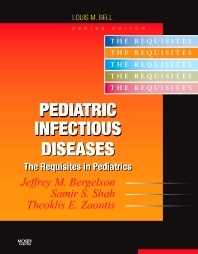 This new volume in the Requisites in Pediatrics series offers expert advice in the assessment and treatment of infectious diseases in children. An emphasis on common conditions enables you to address the cases you’re most likely to encounter, and discussions of unusual infections helps you determine when to seek additional information or consultation. It delivers all this information designed in a way that compliments your practice and in the proven “high-yield” Requisites format—equipping you to master the material quickly. Perfect for quick review, everyday practice, and exam preparation, this is one resource you’ll consult time and time again! Examines infections in terms of their effects on specific body sites or organs to mirror how diagnoses are often made in real practice. Highlights infections in specific patient populations including newborns, transplant patients, travelers, and children with HIV to equip you to address special scenarios. Discusses immunization and basic infection control in doctors’ offices and child-care facilities to reduce the risk of the spread of infections. Presents chapters on fevers of unknown origin and febrile syndromes characterized by rashes to prepare you for difficult-to-diagnose cases. Summarizes basic information and vocabulary concerning microorganisms and antimicrobials essential for the interpretation of laboratory reports. Follows a logical, consistent chapter format to facilitate quick and easy reference. Offers practice-proven guidance on differential diagnoses, lab values / radiologic studies, treatment / therapy recommendations, and advice on when to refer to a specialist. Features a wealth of illustrations and tables that make details clearer, and illuminate important information. Includes highlighted boxes that emphasize relevant case studies • key points of each section • current controversies • and other important topics that can affect your practice.